Olympic and Paralympic medals for the Tokyo 2020 Games will be made from recycled mobile phones. How does e-waste recycling work? Discarded consumer electronics such as smartphones and tablets contain small amounts of precious and rare earth metals, including platinum, palladium, gold, silver, lithium, cobalt and nickel. Scrap cars and home appliances such as fridges and air conditioners also contain these rarer metals, along with base metals, including iron, copper, lead and zinc. Recycling or refining companies either collect or purchase tons of this e-waste and industrial scraps. They then use chemical processes to separate the various metals. Much of this work takes place in developing countries such as China, India and Indonesia. 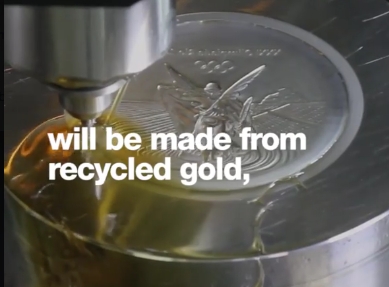 How are Olympic medals made from recycled phones? The Japanese public will be asked to donate old phones and small appliances to gather two tonnes of gold, silver and bronze for the 5,000 medals. The project hopes to promote sustainability and reduce costs. "A project that allows the people of Japan to take part in creating the medals is really good," said Tokyo 2020 sports director Koji Murofushi. "There's a limit on the resources of our earth, so recycling these things will make us think about the environment." Collection boxes will be placed in local offices and telecoms stores from April and will remain there until the metal required has been collected. Members of Japan's Olympic organising committee tabled the idea to government officials and companies in 2016. Olympic host cities have traditionally obtained the metal from mining firms. But Japan, which lacks its own mineral resources, is keen to take the theme of a sustainable future a step further.